However, this game has co-op, and the marvelous puzzle mechanics have to work for up to three players as well as for one, and for the most part, they do. The game plays slightly differently depending on how many players you bring along, as each player controls one of the characters. In a two-player game, either player may switch to whatever the remaining class would be, but it will take an enormous amount of communication to determine who takes over and when. Three players is ideal, as each character will be represented at all times- the Knight can cover everything combat-wise while the Wizard and Thief work on navigating the world and doing their part so solve the puzzles. The challenge is raised considerably in co-op, because you will need to make sure that each character can make their own way through the world instead of just whoever you choose to control, and being able to master combinations of moves is critical. The Knight can use his shield to block fireballs that would otherwise be harder to avoid by the Wizard, the Wizard can attach wooden blocks to ceiling spikes that create a new path for the Thief to grapple on, and the Thief can reach plenty of areas neither of the other characters can. Your range of motion is limited to the edge of the screen, and though the camera will pan back a bit to allow for more movement, you will eventually get teleported back together. 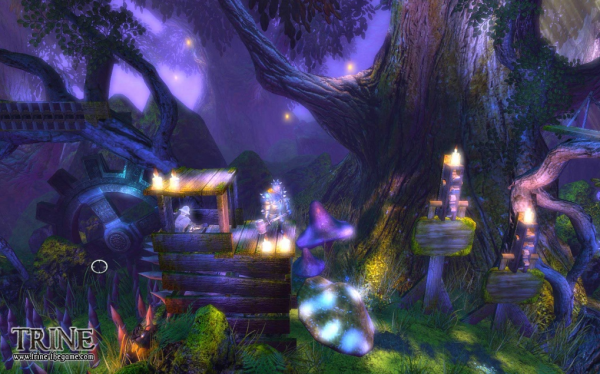 I played the PC version of Trine, and though you are able to play using a mouse and keyboard combination, it is far easier to play using a gamepad. As it happens, the game natively supports the Xbox 360 controller, so if you've got a spare wired controller (or sprung for the wireless receiver for your computer) lying around, plug that bad boy in. Unfortunately, the lack of online play did nothing to help enable decent co-op sessions for me. Getting a crowd of people to a.) huddle around a desk (barring someone hooking their PC up to their HDTV) and b.) have three suitable gamepads to play on is a chore. While the developers have alluded to a possible patch to enable online co-op, it doesn't exactly help players now. When all is said and done, Trine is one of the finest, most charming puzzle platformers I have ever played, and though I would normally remain platform-agnostic, I would have to recommend co-op players lean towards the upcoming PSN release, if only because the couch co-op will be easier to manage, and you won't have to stick someone with the keyboard. The Co-Op Experience: Each player controls a specific character who can manipulate the environment in their own unique way. Players must work together to solve puzzles.